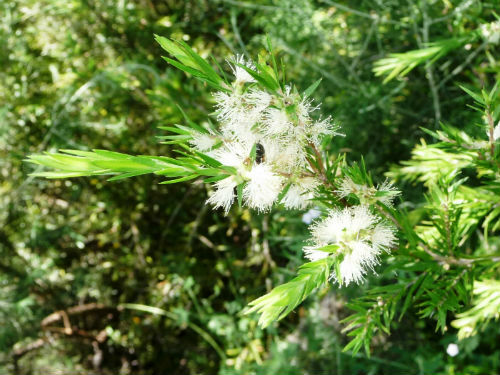 Melaleuca decora is a very tall shrub or small tree that may reach a height of 12 metres. The bark is light brown and papery. Leaves are light green, about 1.5 centimetres long and crowned with a point. Sweetly scented, white flowers are carried in spikes with individual flowers widely spaced. Leaves are often present between the flowers. Flowering occurs in late spring and early summer. The flowering density often obscures the leaves. The nectar-rich blooms attract many native insects. M. decora occurs in coastal areas of NSW and southern Queensland. The species grows in coastal wetlands and areas subject to flooding. In cultivation, M. decora will grow happily in well-drained situations. M. decora would be a colourful addition to screens, hedges or on the margins of dams. The species name is from Latin, décor meaning elegance and refers to the appearance of the plant.